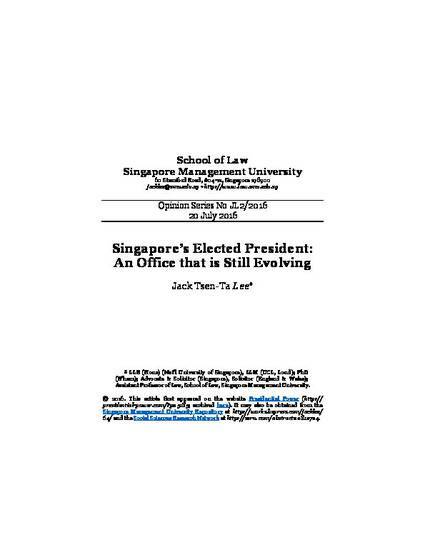 Constitutional changes effected to Singapore’s Constitution in 1991 transformed the office of President from a purely ceremonial one chosen by the Parliament, to one directly elected by the people exercising certain discretionary powers. Among other things, the President may now veto attempts by the Government to deplete the nation’s past financial reserves, and to effect unsuitable appointments to or dismissals of key public officers. Now, the Government is proposing to tweak the system further. This article first appeared on the website Presidential Power (http://presidential-power.com/?p=5185; archived here). It may also be obtained from the Singapore Management University Repository at http://works.bepress.com/jacklee/64/ and the Social Sciences Research Network at http://ssrn.com/abstract=2812724.